I’m staying at the Aspen Meadows Resort as part of the Aspen Institute’s Forum on Communications and Society. The resort is pretty fancy. I pulled up in the RV and no one was sure what to do with me. But there was plenty of room for the RV between the tennis courts. 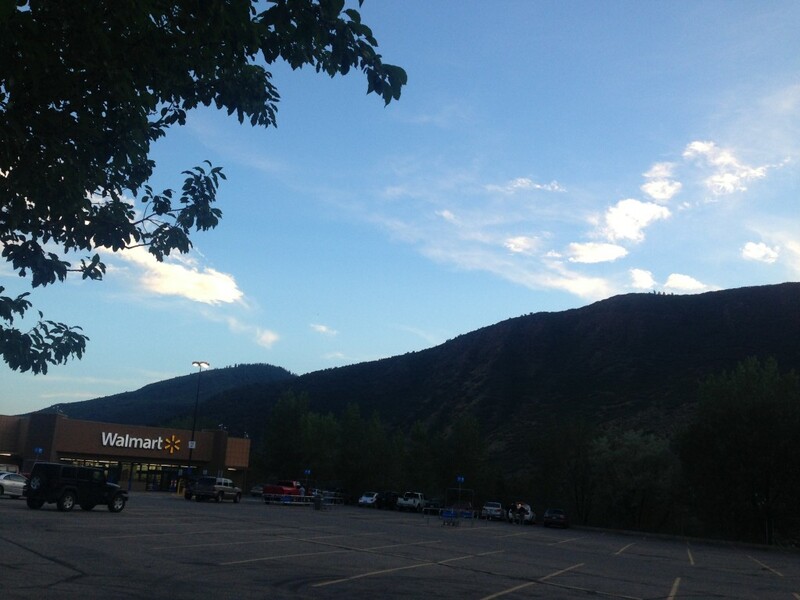 The night before I got to the Aspen Institute, I stayed the night in the parking lot of the Walmart down the road. So it’s just been one fancy night after another. Walmart famously lets RVers stay the night in their parking lots and the bed is just as comfortable as the most luxurious RV park at a fraction of the cost. Since you bring your bed with you. And staying in a parking lot is free. If you just need a place to park your RV overnight so you can sleep, a Walmart parking lot isn’t a bad option. The trickiest part is coffee in the morning. Coffee for me is like air. If I don’t have it the moment I wake up, I just collapse in a heap, unable to move. Forever. And while I’m a fan of good coffee, in the morning I just need any coffee. Before I left Seattle, I thought I had the perfect solution: a compact Nespresso machine. Easy, no mess, consistent coffee. But once I was on the road, I learned about battery power. And how it’s not the same as being plugged into electricity. The maximum draw is about 700 watts. And even the tiniest Nespresso machine needs about 1500. Sure, I can use the generator for more power, but it’s loud. And I’m still worried about those RV message boards and how the experienced RVers are going to gossip about me waking everyone in the Walmart parking lot up just so I can make some coffee. I had this realization my first morning out (in the amazing mall parking lot). Fortunately, I had stocked up on Starbucks Via and had enough presence of mind (which is more impressive than you think for me first thing in the morning without coffee) to boil water on my (propane) stove. I then began an exhaustive hunt for electric kettles that were under 700 watts. Mostly they don’t exist. I finally found one at 600 watts, but as soon as I plugged it in, it surged through the system and drained all the power. Then I tried an electric kettle that plugs into the car’s cigarette lighter (I found it at a truck stop, the magical land of everything car powered your imagination can summon) but it took about 20 minutes to heat up the water. Finally, I bought an old-fashioned kettle that heats up water on the stove. If I’m plugged in, I use the Nespresso. If I’m not, I heat up water in the kettle. Although if I’m in a Walmart parking lot, there’s probably a McDonald’s nearby. And I have just enough energy when I wake up to walk about 25 feet and speak the number of words required to order coffee. Except at the Aspen Institute, I was talking to someone I know who is really only into the coffee that’s good. And he had brought an Aeropress with him (as he does everywhere he travels). So each morning we meet out at my RV (er, after I’ve had enough coffee from the room to walk outside), I heat up some water, and he makes us the most delicious coffee you ever would hope to drink. He has to bring his own coffee cup, obviously. This entry was posted in Overnight. Bookmark the permalink.